This portable waterproof soft cooler is worn like a backpack and keeps ice frozen for up to 24 hours. Dimensions: 16" x 8" x 8"
Dimensions: 16" x 12" x 12"
Purchased as a gift, enjoyed by recipient! My husband loves this and he’s super picky!! Keeps ice forever and easy to transport. Purchased two lightweight ice mules and forgot all about Yeti real quick! 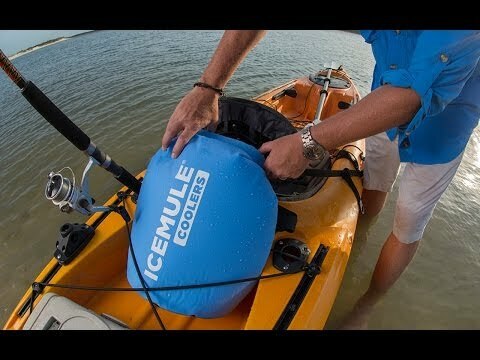 The next time you're preparing for an outdoor adventure, pack your food and drinks in the IceMule, a portable, soft-sided, ice bag with all the cooling and insulating properties of a hard cooler, but none of the bulk. Designed to sling over your shoulder for handsfree carrying, it’s made with no seams and is completely waterproof. IceMule was created by Virginian and avid outdoorsman, James Collie. His inspiration came on a mountain hike, when he lined a daypack with trash bags and loaded it with drinks and ice. It seemed like a great idea at the time, until the plastic ripped and icy water flooded down his back. Fourteen prototypes later, The IceMule's patented double layer shell and insulating foam keep ice frozen for up to 24 hours. Tested against a standard cooler, the IceMule was 16 degrees colder for more than five hours longer. Fill it, roll it and securely fasten with buckle clips. A padded strap makes it comfortable to wear on long hauls, and it easily collapses and stores in its own sack. 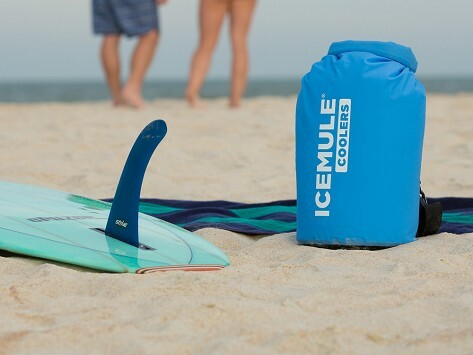 Whether you're camping, hiking, boating, or just hanging at the beach, an IceMule Cooler is one super-cool piece of gear.